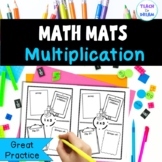 Also included in: Go Math's 3rd Grade Reviews - COMPLETE Bundle! A wonderful hands on... or should we say fingers on multiplication activity! Students use finger paint or stamps to make thier own arrays. Once students create their own arrays, they show how to write a multiplication sentence and repeated addition sentence which describes the arrays they created. 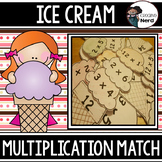 This set of 16 multiplication and division constructed response tasks will transform your students into real problem solvers. They cover the Common Core Standards: 3.OA.1, 3.OA.3, 3.OA.5, 3.OA.7, and 3.OA.8. This is a great center activity that can be done individually or in pairs. 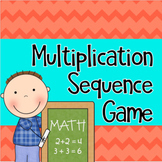 This game covers the basic multiplication facts from 2- 11. 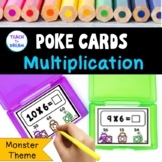 This center will get your students thinking about what factors and products really mean along with practice their multiplication facts. Students will have a ball solving the multiplication mystery as they find the missing product or factors. 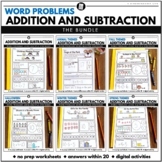 Suitable for 3rd-4th grade students. The presentation covers a multitude of Language Arts Skills: Literary Analysis, Expository Analysis, Grammer, Word Analysis and more. You are sure to love this presentation. If you do, please recommend this to your fellow teachers. Many thanks. This is a small packet of Multiplication & Division Assessments for 5th grade Indiana Academic Standards. 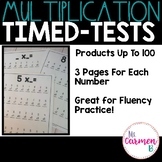 It includes a pre-test and post-test for both Multiplication & Division, as well as an answer key. 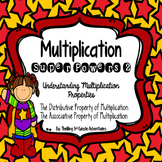 (2 assessements for Multiplication and 2 assessments for Division).